What should we be conserving? Which animals should be free to roam the British countryside; free to behave as naturally as they can. And who gets to decide? These questions have come to the fore once again in recent weeks, albeit in very different circumstances. The idea of rewilding parts of these islands continues to incite controversy and anger, as well as inspiring our imaginations. Rewilding, in a nutshell, is about allowing natural processes to take prominence over human ones. This includes the notion of bringing back animals (or indeed plants, in theory, but it’s almost always animals in practice) which perform vital ecological functions. Animals such as the Beaver, which is now well establised in parts of Scotland, and starting to become so in England. Some also argue that the Lynx should be brought back, but even a discussion of this idea, has elicited outrage from the sheep-farming community. And don’t even mention the Wolf. Hunters will explain that they now perform the role formerly undertaken by extinct predators such as the Wolf and Lynx. This is unlikely, of course, to have been the motivation for celebrity huntress Larysa Switlyk, who hit the headlines when it became clear that her visit to Scotland was not solely for self-publicity purposes, but to hunt and kill a feral goat on the Island of Mull. Pictures posted on social media by Switlyk also indicate she shot a sheep during her “hunting” visit to Scotland. Understandable outrage ensued. Who would hunt a sheep? Well, there are historical precedents, perhaps most notoriously the Eton Ram Hunt, where boys of Eton College carried out a ritual hunt of a ram at the beginning of each school year – at least up until 1740. 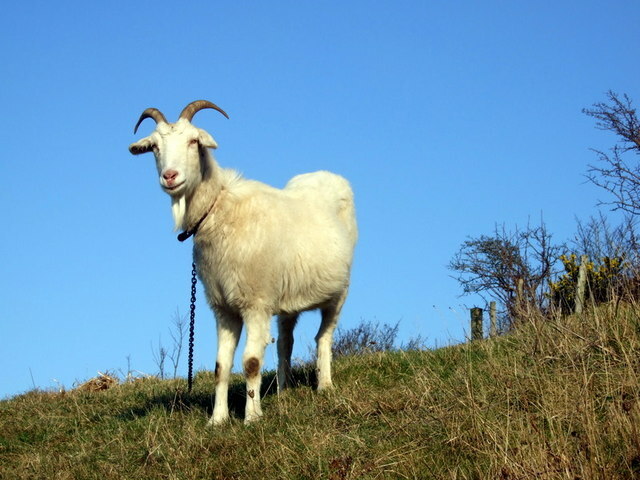 Feral goats are by their nature, escaped domestic goats which have found a wild place where they can live and breed. They are wild, but they are not a native wild animal in the sense that Red Deer, or indeed Wolves, are. In the case of Ms Switlyk, she has permission from the landowner to hunt the goat (and one assumes the sheep), so was acting within the law. The same principle applies to feral ponies. The Cumbrian Fell Pony is thought to have originated from Friesian horses brought to Britain by the Romans, although the evidence for this is not conclusive. These Ponies carried out hard physical work, especially in the farming, timber and mineral extraction industries for which the Lake District was so famous. What is clear is that these Fell Ponies have roamed the fells of Cumbria for several centuries. They are not wild and no longer breed without human intervention, as the stallions are not allowed to run wild with the mares. But the mares and foals do (in some places) live all year round on the fells. Many of the Lake District’s famous remote and bleak fells are also registered Commons. Commons are owned by a landowner, but Commoners (a right usually associated with living in a farm near to the edge of a common) have rights to use the Common – and these tend to be rights of grazing. And these grazing rights can include the right to graze sheep, cattle and ponies on the commons. One such Lakeland common, Birkbeck Common, has been the location for a slow-burning controversy which recently came to a head. It has pitted National and International wildlife law against Commoners’ rights, and is a microcosm to explore the question of who decides what should be conserved. Mr Potter, A Birkbeck Commoner, prominent in the world of Cumbrian Fell Ponies, was running a herd of Cumbrian Fell Ponies on Birkbeck Common. Natural England has responsibility to ensure that Birkbeck Common – part of a Site of Special Scientific Interest (SSSI) and internationally protected Special Area of Conservation, is managed in such a way that the valuable wildlife present there is not harmed. Monitoring the site over a number of years, Natural England staff concluded that Birkbeck Common was being overgrazed by Mr Potter’s ponies. Overgrazing at Birkbeck Common was first brought to the attention of its predecessor English Nature, in 1995. The Commoners had entered into an agreement with the Government in 1998 whereby they would be paid to reduce the number of animals they kept on the Common. This agreement was replaced by an updated Higher Level Scheme agreement in 2010. In this new agreement a much lower number of Fell Ponies were allowed to stay on the Common. It would appear, however, that the owner of the ponies felt that they had a common right to let his ponies stay on the common all year round, against the decision of Natural England. Things came to a head in 2013 when the Common owner, working with Natural England and the Council, organised for Mr Potter’s ponies to be rounded up and removed from the Common. Mr Potter subsequently returned his ponies to the Common. Things took a turn for the worse from there, until eventually Natural England commenced legal proceedings against Mr Potter in late 2017. This culminated in Mr Potter being found guilty on 12th September this year. He was fined £1,320 for illegally grazing the Site of Special Scientific Interest. He was also ordered to pay the prosecution costs of £15,000, plus a victim surcharge of £66. Mr Potter’s solicitor has said he will appeal the finding. Another NE Board member, former National Farmers Union uplands chair Will Cockbain, recently retired from Natural England’s board. Mr Cockbain did not feel the need to declare the fact that his wife has been and continues to be a Council member of the Fell Pony Society. Two relatives of Mr Potter’s also sit on the Fell Pony Society Council. And his solicitor also stood for election to the charity’s Council in 2016. It’s worth bearing in mind that Natural England very rarely resorts to prosecution for damage to Sites of Special Scientific Interest. No criminal proceedings were brought at all during 2015-16. Indeed NE has been criticized repeatedly for failing to prosecute in high profile cases such as Walshaw Moor. I can only assume that NE must have felt that the case was a strong one, but also that it was in the public interest to take legal action against this 79 year old hill farmer. Equally Mr Potter would presumably have felt that his ancient common rights of grazing were being threatened, and that the conservation of the Fell Pony was also under threat. But the weight of the law sits behind the SSSI designation, and especially so for those SSSIs which also have European protection, as Birkbeck Common does. The irony of this particular case is that other ancient Pony breeds such as the Exmoor, Dartmoor and Welsh Mountain Ponies, are used specifically for conservation grazing, because they are hardy and can eat pretty much anything. It’s just that in this case, the presence of this herd, all year round, was damaging the vegetation of the fell. Some will argue that the most important thing to protect and conserve in the Lake District, is the farming system, which includes the Commons and the Commoners. James Rebanks, the Herdy Shepherd, believes this system of farming and commoners is the most important element of the landscape; it’s what defines and maintains the landscape. Others will argue that rewilding means shifting domestic grazing animals off the Fells to allow trees to grow back, for a more “natural” landscapes. To return to my original question then, who decides which animals are allowed to roam freely across the landscape? Should it be the landowner, the commoner, or the State, influenced by lobbying from special interest groups of all shapes and colours? And where should the focus of conservation be – bringing back extinct wild animals, conserving feral ones, or protecting ancient farming systems? There are good reasons for arguing that all of these things have value to Society. But as the Birkbeck Common case shows, they cannot all exist in the same place at the same time. This entry was posted in commons, Fell Ponies, hunting, Natural England and tagged Cumbrian Fell Ponies, feral goats, Natural England, trophy hunting. Bookmark the permalink. 3 Responses to Evicting feral ponies, trophy-hunting feral goats. Who decides what goes where? One thing that makes the English landscape so special is the rather quaint way decisions are made. On a local scale it all seems rather haphazard with farming, conservation, sporting, leisure and other interests playing varying roles in different areas, on a landscape scale and on a national scale I think the patchwork of differing interests works quite well (for a small overpopulated island). Large areas of intensive management generally lower the value of the land in my opinion. Bringing back a full range of predators will be a challenge, along with all the other now extinct species that once fully managed our landscapes. And even if we could – slaughter by trained marksmen surely would be preferable to most ‘natural’ methods, or starvation that will accompany many Rewilding projects. The cycles of abundance / carnage / scarcity that mark natural systems utilise cause much suffering … can’t we humans do better ? It is the manner of Ms Switlyk that maybe causes most offence to British sensibilities; though killing animals that did not need be slaughtered should also give ample cause. We should urgently Rewild huge portions of the planet, for climatic and other vital reasons. There will be many variations on the theme no doubt. The Knepp Castle Rewilding model seems very appropriate . Merging these principles with high welfare animal farming needs fully considering; I was deeply impressed by the truly holistic principles applied at a Biodynamic farm I filmed recently ; run in this case by a vegetarian; with no toxic chemicals in form of carefully managed abundance relying on animals. And there are other exemplars; the pastoralists of the SW Asian uplands who manage their livestock according to ancient sacred traditions – and in turn maintain all the Convention on Biological Diversity (BAP) target species in their environs (as well as the regional Water Cycle). Maybe … it is defining just what precisely is sacred and relevant here that we are struggling with. Another interesting and thought-provoking article. Thank you, Miles. I am in the middle of reading George Monbiot’s “Feral” so all of this rang bells for me!